This casserole is my favorite comfort food, and it’s sooooo versatile. 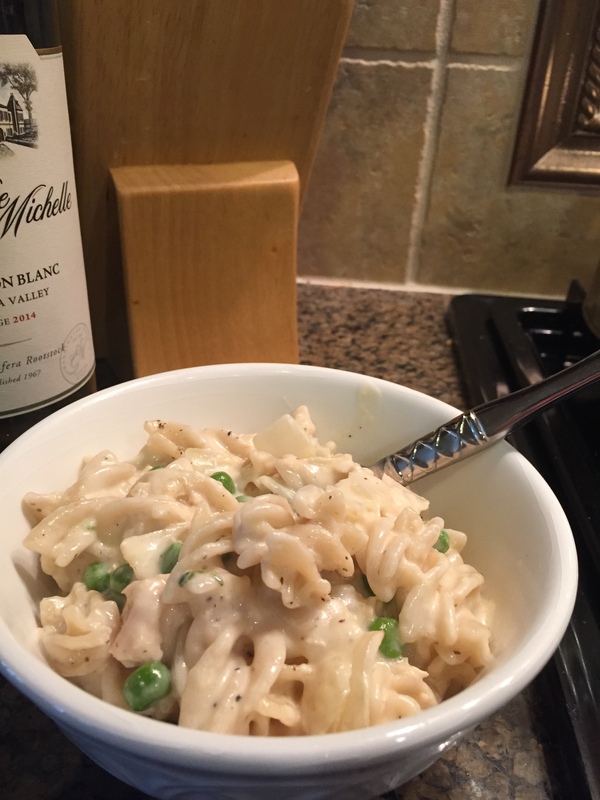 It just so happens that my hubs loves tuna noodle, but you can easily swap out the tuna for chicken and add in your favorite veggies to change it up. I included a lot of photos here, so it looks more complicated than it is. I promise, this is an easy go-to dinner that’s ready in less than 30 minutes and tastes like heaven- with NO cream of whatever soup 🙂 Give it a try! Some (like half a pound) organic fusilli. I like organic brown rice fusilli- it cooks soooo fast, and is a lot lighter than wheat-based noodles. They’re also gluten free. 1 small onion (red, yellow, vidalia, it’s up to you)- chopped however you like. My kiddos are cool with big hunks of it, so less chopping for me! Some organic unsalted butter (like 2 tablespoons). You can use olive oil here, but you’re better off with butter- just don’t make it a habit, kay? Organic garlic. I love mine fresh from the farm- but this kind has to stay peeled and in the fridge. Don’t do the minced stuff here- just don’t. Pull out a garlic press or smash it with a knife- use as much as you like. I used 4 cloves. White wine– your favorite type. Or chicken/vegetable stock if wine isn’t your thing. Start off by boiling your pasta. If you’re using brown rice pasta, be ready- it will be done in 5 minutes. Seriously. While that’s going, melt your butter (or if you’re doing EVOO, warm it in the pan) over medium-high heat. Add in your onion and the herbs you want to use. I’m growing thyme on my back porch, and I think it adds AMAZING flavor here- so that’s my herb of choice. Once your onions are transparent (like 2-3 minutes, maybe 5 if you’re closer to medium heat than high), add in your garlic. I love garlic, but I like it fresh- not the kind you buy at the store, but the kind that comes fresh out of the dirt on a farm. The farm-fresh garlic is milder and has a more subtle, sweet taste, so you’ll need more. I needed 4-5 large cloves. But if you buy at the store, you’ll probably want to use less. Saute your garlic for 2-3 minutes, then make a circle 2-3 times around the pan with your wine. It comes out to be about 1/4 a cup- but use more for more flavor if you like, and reduce it down. Once you have a really fragrant mixture of onions, garlic, herbs, and wine, you can add your heavy cream. I added about 2/3 a cup by estimation- shoot to have about 1/2 inch of liquid in your pan. Add flour by the tablespoon to thicken the mixture to your liking, stirring with a wooden spoon as you go. Add the peas here- as many as you want. Cook until soft. Add in your parmesan cheese. I throw in a handful (sometimes two! ), and stir some more, just till combined. Toss in your tuna, stir, and add more herbs, pepper, and lemon juice to taste. Voila!